Bishop Gainer, Fr. Wolfe, Gerry Ganse, members of Order of Malta, parishioners of historic St. Joseph’s Parish, all dear friends in Christ: Warmest thanks for your kind invitation to take part in this annual Sanctity of Life Mass. I am delighted to join with you in giving thanks to God for the gift of life. At the heart of the charism of the Order of Malta is profound respect for the gift of human life, especially the lives of the poor, the sick, & the vulnerable. Indeed, the animating spirit of the Order is well expressed in our daily prayer. After asking for the wisdom & strength to defend & foster the Catholic faith, we say: “[B]e it mine to practice charity towards my neighbors, especially the poor & the sick”. Embracing the God-given dignity of “our lords”, the poor and the sick, loving them with the charity of Christ who for our sake became poor: this is indeed a most beautiful way for us to give thanks to God for the gift of life. In the Lancaster area, gratitude for the gift of life is expressed in many ways, whether it’s your service to the residents at St. Anne’s Retirement Community, or the St. Anne’s Brown Bag Lunch, or providing a warm meal each week at the Catholic Worker House. One of the most magnificent ways the Order celebrates the gift of life is the annual pilgrimage to Lourdes, a pilgrimage I’ve been privileged to take part in on many occasions in the past, and God willing, this year also. If you’ve ever gone on this pilgrimage, you know what I mean. While the weather in Lourdes, even in May, is always questionable, the love of the Malta members and volunteers for the malades is beyond question. Here you see tenderness, compassion, and love of life as the Malta pilgrims bring the sick and suffering to be with Mary – to share in her powerful intercession, to have her lead them to Christ who heals and redeems us in ways that exceed our capacity to understand. How many miracles! Miracles of the body! Miracles of the soul! Those who share this pilgrimage cannot help but give thanks to God for the gift of life! Pope Francis leads us to the same truth but in a different way. In his encyclical letter, Laudato Si, on the care we owe to creation, he speaks of “integral human ecology” – and let us ask ourselves what this means. In the context of urging us to treat the environment with respect, the Holy Father also urges us to develop a social environment in which human beings can attain both the right to life and ample opportunity to grow, to flourish, to contribute. This means caring for nature itself, seeing ourselves as part of nature, and creating the social, economic, and cultural conditions in which human beings can both live and flourish. How often I pray about this teaching, living as I do in a city marked by unprecedented levels of abortion, poverty, and street violence. How prophetic is the Pope’s vision of human life, filled as it is with thanksgiving to God who is the Creator and Author of our lives and the lover of our souls. The Church’s teaching on human dignity and the charism of our Order spur us on to build a culture, an environment in which human life can flourish. Yet, as we know, more is needed: we also need to foster a spirituality of life, a deeply engrained sense that life is not only valuable but indeed sacred. Thus, all of creation is good and reflects God’s wisdom and love yet each human life is made in God’s image, each person is willed into being by God, each person is loved by God, each has an inbuilt desire for God, each is called to friendship with God, each has a mission in life. Such thoughts are not peripheral to our faith but central and should be at the heart of our daily life of prayer, our practice of our faith, and our embrace of the charism, the inner dynamism of the Order of Malta. Paul’s offers us a key to this spirituality in his Letter to the Ephesians where he tells us that we were chosen for eternal life in Christ “from before the foundation of the world.” From all eternity God sought us out to be holy and blameless! From all eternity God, as it were, hungered for our friendship, our love. How the Lord must love us! How he must love those he calls us to love and cherish! Let us think of Isaiah and of John the Baptist our Patron who were called in their mother’s womb to announce the coming of the Lord. Thus Isaiah proclaims: “The Lord called me from birth, from my mother’s womb he gave me my name.” And again: “For now the Lord has spoken, who formed me as his servant from the womb.” In the same way, the Virgin Mother of God entered the house of Elizabeth, the baby in her womb, John the Baptist, leapt for joy, so near was our salvation. Not everyone has a special role in salvation history such as Isaiah or John the Baptist, but as Jesus embraced the little children in the Gospel, he saw how the Father in heaven loved them and he saw also the greatness to which he called them. This too is why Jesus, the Good Shepherd does the uttermost to save even one straying sheep, to save and conserve a life. Yet a spirituality rooted in the sacredness of human life means more than our being convinced that all human life is sacred or that we have an obligation to serve the vulnerable as well as to work for the end unjust laws that devalue the unborn & the frail elderly. It means that thanksgiving for the gift of life is something that we do every day – giving thanks for the gift of life given to us and to our loved ones – but also giving thanks for the lives of those we are called to serve – the unborn, the pregnant mother in distress, the poor and chronically ill, a young person on the street without family, role models, or a chance to succeed, and so many, many more. In giving thanks to God for their lives, we move beyond our limited point of view and begin to see those we’re sent serve as God sees them and to love them as God loves them and thus we dedicate ourselves anew every day to building a culture, an environment, in which all human life is respected and cherished. O Mary, Mother of the Life within, all life we entrust to you; the life of every expectant mother and the child within her womb; the life of every human body; the life of every human soul; the life of every newborn child; the life of all grown old. You held the Lord to your own heart and drew him so close in. So draw us now in all our needs, O Mother of the Life within. Archbishop William E. Lori was installed as the 16th Archbishop of Baltimore May 16, 2012. 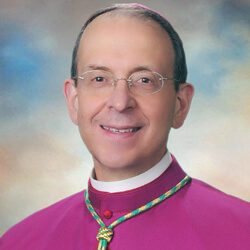 Prior to his appointment to Baltimore, Archbishop Lori served as Bishop of the Diocese of Bridgeport, Conn., from 2001 to 2012 and as Auxiliary Bishop of the Archdiocese of Washington from 1995 to 2001. 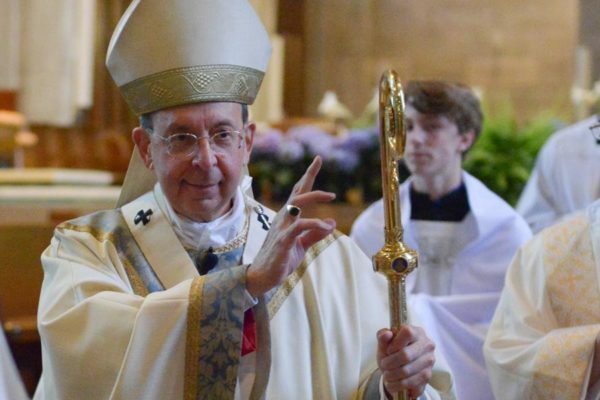 A native of Louisville, Ky., Archbishop Lori holds a bachelor's degree from the Seminary of St. Pius X in Erlanger, Ky., a master's degree from Mount St. Mary's Seminary in Emmitsburg and a doctorate in sacred theology from The Catholic University of America. He was ordained to the priesthood for the Archdiocese of Washington in 1977. In addition to his responsibilities in the Archdiocese of Baltimore, Archbishop Lori serves as Supreme Chaplain of the Knights of Columbus and is the former chairman of the U.S. Conference of Catholic Bishops' Ad Hoc Committee for Religious Liberty.